It is hard to open a newspaper, book, or magazine without finding some inference to the earth being billions of years old. Given the overwhelming barrage of statements to the contrary, it is understandable why so many people have trouble considering the possibility that the earth might be younger. Yet there is an intriguing possibility that the earth may indeed be much younger than this commonly repeated "billions of years". Once any event has passed, the scientific method cannot be used to prove that it has even happened. The scientific method cannot even show us whether or not George Washington ever existed! However, this does not mean that the event did not happen. Although the evidence for a past event is outside of the repeatability of the scientific method, historical and secondary evidence can be considered in determining, beyond a reasonable doubt, when and how this event happened. This understanding of what experimental science can and cannot do relates directly to dating methods and determining the age of the earth. Despite what many people have been lead to believe, there are no dating methods which give an absolute date for the formation of the earth. All dating methods are based on non-provable assumptions about some event in the distant past. Furthermore, there is a strong bias to reject any dating method which does not allow enough time for evolution to supposedly have happened. To understand the validity of any date, the reader must gain an understanding of how all dating methods work. The following illustration should help: Suppose you were up at 6:00 a.m. and happen to see a friend who lives in a nearby town. You observe that he is walking along at 2 miles an hour and you know that he lives 16 miles away. Using your exceptionally keen reasoning power, you can deduce that your friend left home 8 hours earlier. You have just performed a dating method of how long your friend has been on the road. However, something doesn't make sense. Why would your friend be up all night walking? Although you used the correct formula, your assumptions may not have been correct. Perhaps your friend stayed with someone in town and woke up minutes before for a morning stroll. In this case, you have used the 'WRONG INITIAL AMOUNT' in your calculation. Perhaps she took a shortcut which cut 12 miles off her walk. In this case there was 'CONTAMINATION' of the total amount. Perhaps since you last saw your friend, she has taken up marathon running and averaged 8 miles an hour (only having slowed down just before you saw her). In this case you have used the wrong 'AVERAGE RATE'. The point is, wrong assumptions lead to wrong answers. 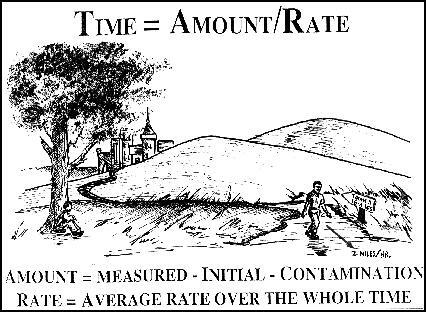 In all dating methods the initial amount is an assumption, the estimate of contamination is an assumption, and the overall rate is an assumption. The only thing which can be known for sure are the present amount and the present rate. Unless you estimate the initial amount correctly, the rate correctly, and the assumption of contamination correctly... your answer will be wrong. There are many old age dating methods which seem to indicate that the earth is very old. However, there are even more dating methods which indicate that the earth is quite young. The evidence for creation is not dependent upon the age of the universe. However, if the earth is relatively young then evolution could not possibly have happened and creation becomes the only logical alternative. Could this be the primary reason that only those methods which seem to indicate very old ages are accepted?